While the stock market had one of its best months in years, it was, like the jobs report, uncorroborated by almost everything else. The junk bond bubble, in particular, stands in sharp and stark refutation of whatever stocks might be incorporating, especially if that might be based upon assumptions of Yellen’s re-found backbone. Do or do not, corporate junk remains unimpressed and therefore depressed against the same background drowning as has been in place going back to June 2014. 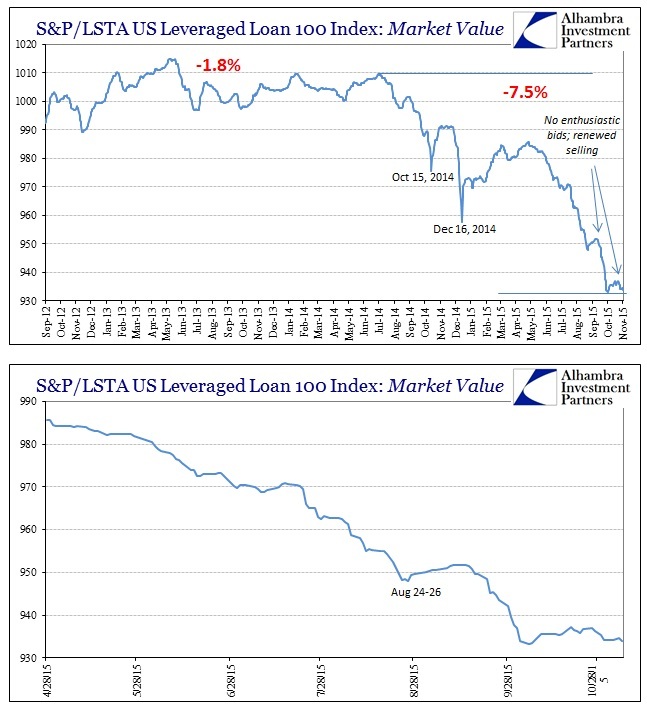 At yesterday’s close, the S&P/LSTA Leveraged Loan 100 index had fallen back to only a few fractions above its early October multi-year lows. 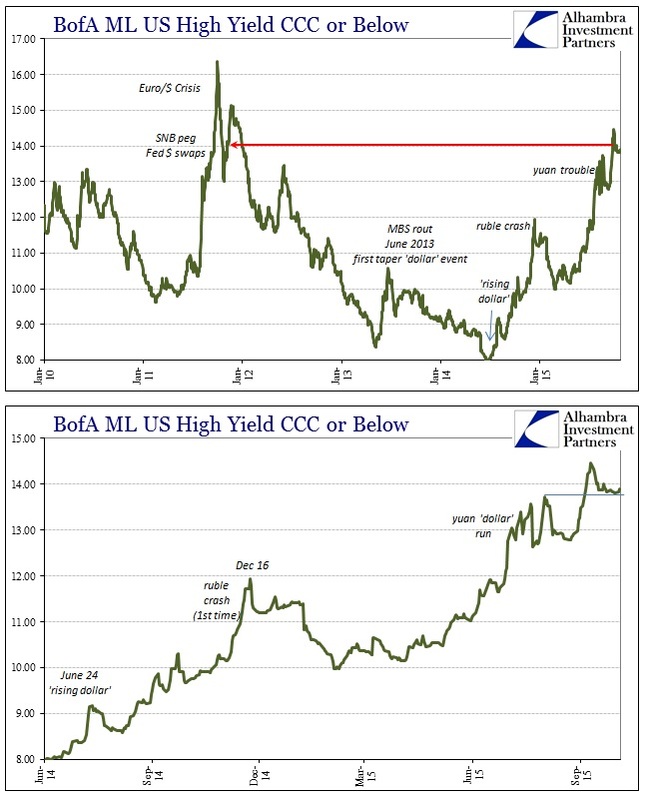 That price action was matched by other high yield, high risk bond views. 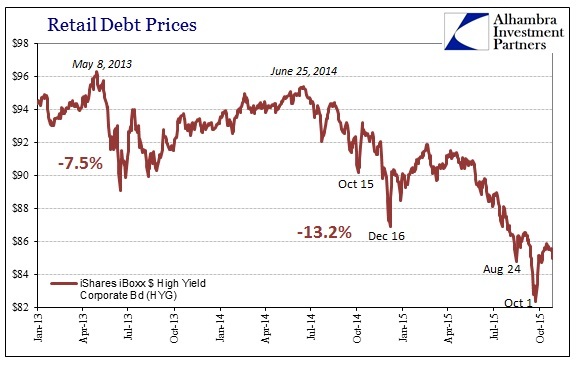 Retail junk debt prices have been somewhat more responsive which isn’t surprising given the mood in general stocks (or at least the narrowing segment of stock markets and indices that are rising). Though more so than institutional, even retail junk prices have begun to turn around again of late. Undoubtedly, part of that is due to what can only be termed and categorized as atrocious liquidity conditions. 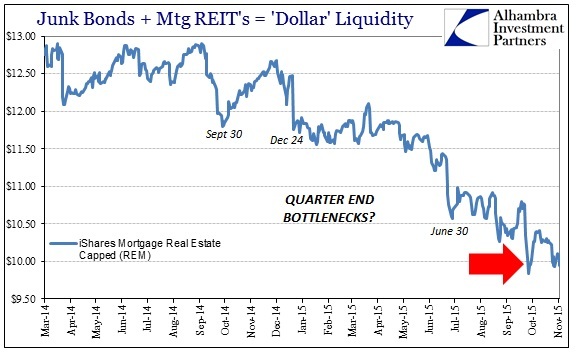 The mortgage REIT ETF REM suggested a quarter-end liquidity bottleneck at the end of September before rising as HYG (the two are well-correlated). However, in recent days REM has sunk almost to that late September nadir, suggesting, firmly, that “dollar” funding and perceptions are continue to be far more problematic than the unspecifiable euphoria elsewhere. The recent turn toward “hawkish” opinions about FOMC predilection has sparked some noteworthy returns in “dollar” proxy currencies, especially the franc. 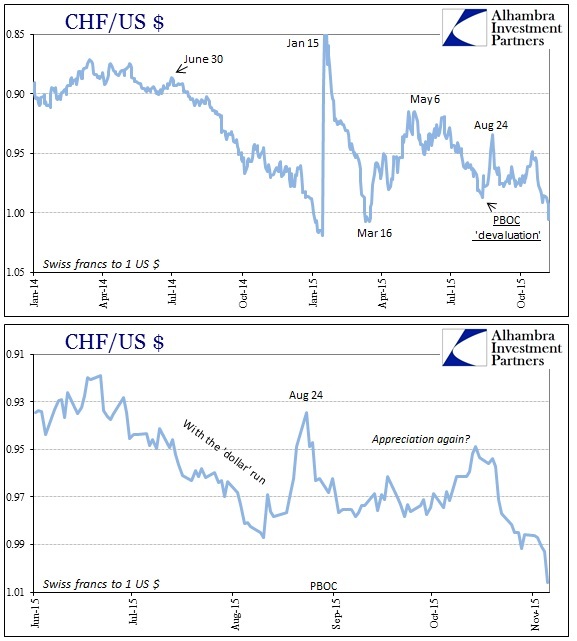 The Swiss currency had been trading in bouts of appreciation which tied closely to upwelling in fear and safe haven demand. Around October 21, however, the franc suddenly fell under a sustained bout of depreciation that has brought it to parity with the dollar. That is almost the same disastrous level that forced the SNB to noisily and dangerously abandon the euro peg back on January 15. 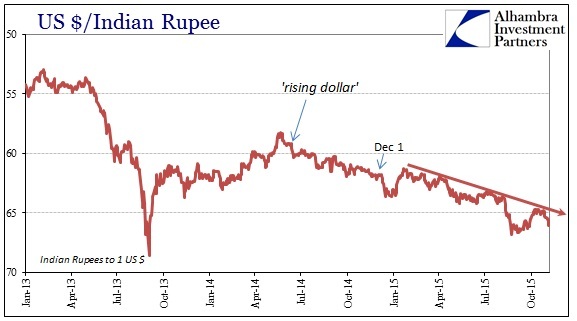 Whether that relates to the changing views of monetary policy isn’t fully clear, but it would be a reasonable assumption especially as this return is matched by other currencies such as the Indian rupee. Of course, behind all this is the “dollar” which continues to press devilishly in the same perturbed direction. I examined this morning the commodity and even eurodollar futures view of that, but the most concerning parcel has to be interest rate swaps. 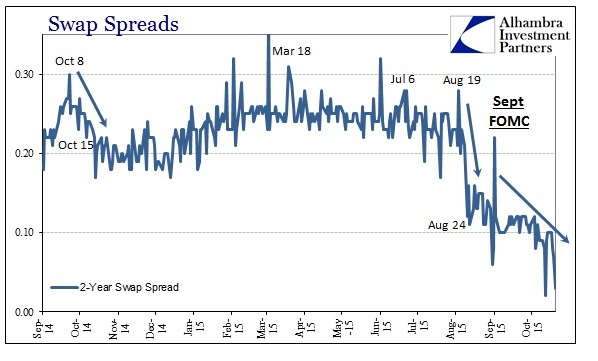 As noted on several prior occasions, swap spreads have been sinking fast and to unprecedented levels. Though mainstream commentary will provide plausible-sounding excuses, mostly about corporate or even UST issuance, that is only because these places will not even consider that Janet Yellen has it all wrong; thus, they only search for possibilities that allow that narrative to remain undisturbed even though that narrative itself can never account for negative spreads. A negative swap spread…assaults conventional financial sense. To most, a negative spread is nonsense and leads to so much consternation about how to interpret the situation when it has arisen. Unfortunately in 2015, especially after July 6, it has been near-universal across far too many maturities. While on the surface it would suggest that the “market” in swap derivatives is pricing more risk of UST’s than swap counterparties, the only real inference about such compression is the nonsense itself. 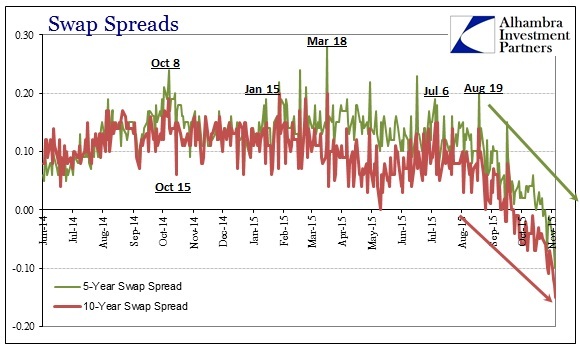 In other words, the nonsense nature of negative swap spreads is precisely the point – for them to be negative in the first place, let alone highly so (like the 30s again), is a pretty unambiguous signal of malfunction if not full distress. It is only great imbalance that can change the information content of a market price into meaninglessness; therefore we can interpret that case as some great reduction in balance sheet capacity since it is dealer capacity that determines the nature of the spreads. This is not a revelation to anyone paying even slight attention to what has been taking place in global, eurodollar banking of late. The banks themselves have all but declared that they want out, with the events of this last “dollar” run convincing them to do so at all possible haste. 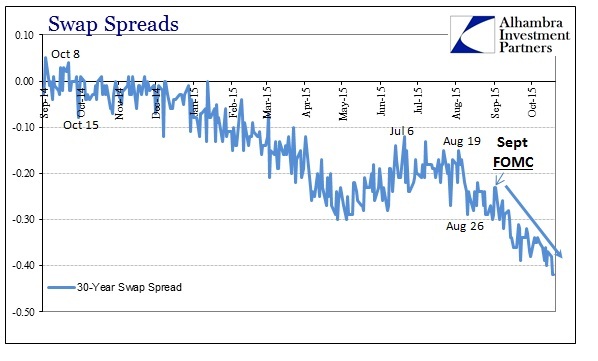 If banks are withdrawing capacity and swap spreads have turned not just nonsense but insanity, then we can only conclude taking banks at their word. That brings us back to dear Janet. 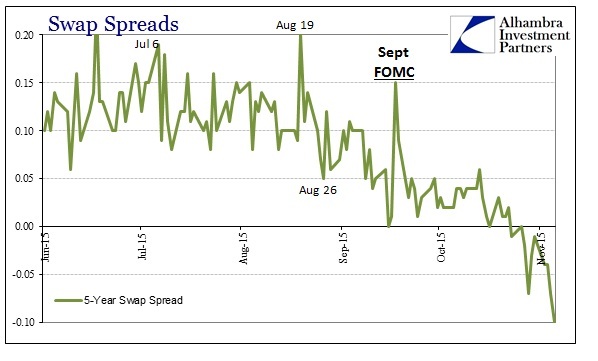 What is most notable on the charts above showing all the swap spread maturities is the inflection surrounding the September FOMC, not the October meeting. 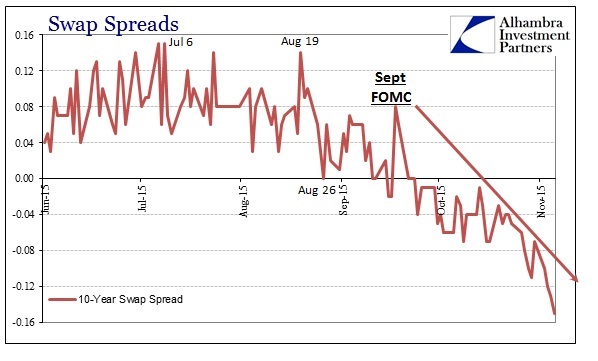 In other words, spreads turned quickly downward where the Fed chickened out and thus confirmed the dead recovery (and the end of “transitory”). That they continued to be negative even after supposedly the FOMC revisited their nerve more than suggests what I explained this morning – that the background recovery and “dollar” baseline has been set and that any changes in monetary policy are secondary if not further remote. Thus, all Yellen et al can do is make a bad (and growing far worse) situation that much worse. I believe that is why they intermittently seem to gain resolve only to lose it closer to their own call for action. This view is all the more pressing given that the likely specifics of the balance sheet capacity withdrawal emanating from those very banks that followed Yellen toward her recovery idea in the first place – Deutsche Bank and Credit Suisse, perhaps even Goldman Sachs. That means that this descent into economic and financial darkness is being driven by the same firms that were once completely, utterly and fully onboard the recovery and its most optimistic case. Their “betrayal” then simply completes and confirms the recovery’s mangled and explicit end. As I wrote back in late September, ignore swap spreads at your own peril; a sentiment increasingly applied beyond the “dollar” into the real economy as one follows the other here and across the globe.